I’m concerned—very concerned—about our president’s entanglement with Russia and his curious affection for Putin. I’m distressed—highly distressed—over his anti-immigrant policies and the bigoted mindset underpinning them. I’m disgusted by the Leninist, destructive philosophies enunciated by his most senior advisor. I’m incensed by the cynicism reflected in his cabinet appointments. I’m appalled at his unabashedly authoritarian tendencies and his obvious ignorance about fundamental civics. I’m horrified by . . . well, I could rant on, but you get the point—I’m alarmed. 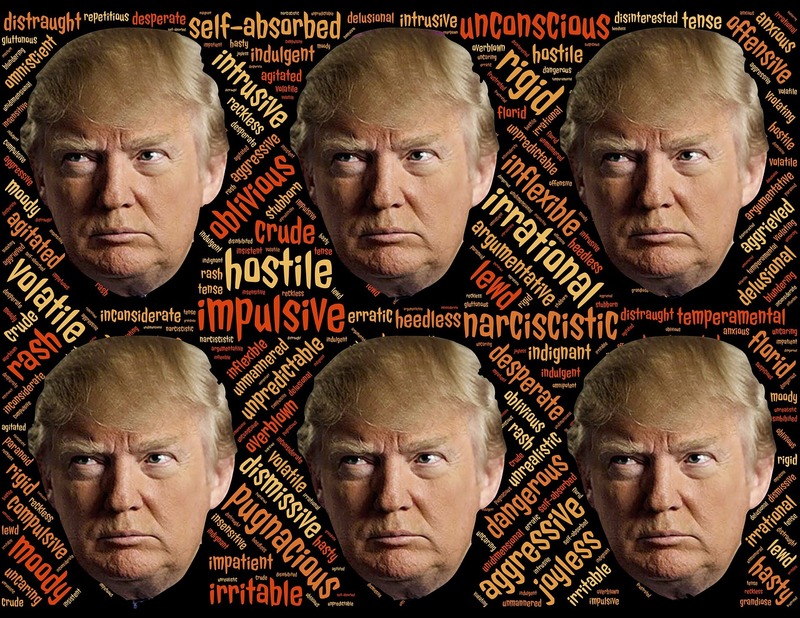 What troubles me the most, though—the nagging surmise that’s assaulted me since the earliest days of his campaign, looming exponentially larger with each off-script campaign rally tangent, each impulsive pre-dawn tweet—is this: I think our president may be impaired by an involuntary dissociative abnormality that substitutes fictive imaginings for actual awareness. Translation: I think he’s bonkers. I’m not so much referring to the malignant narcissism or the obvious neurotic insecurity. While those attributes are, to say the least, unsettling, they are separate and distinct from the more fundamental question of whether the President of the United States is in full possession of his faculties. One need not have a Ph.D in psychology to understand the difference between lies and delusions. The former are knowing, deliberate misstatements, intended to deceive—a liar knows he or she is lying, knows the difference between truth and falsehood, and lies despite a conscious understanding that the truth is other than the lie. The latter—delusions—are beliefs that have no basis in fact or reality, beliefs that are, in fact, objectively false, but which the believer, notwithstanding fact and reason, honestly maintains to be true. Liars, despite their lies, are fully connected to reality. Delusional people are not. And so what to make of the man who insists that he saw thousands of Muslims in Jersey City cheering the 9/11 World Trade Center attack? What to think of the man who says Ted Cruz’s father was with Lee Harvey Oswald on the date of the Kennedy assassination? How do we assess a man who insists, despite irrefutable photographic evidence to the contrary, that 1.5 million people attended his inauguration, or who claims, despite refutations from election officials of both parties, that 3,000,000 to 5,000,000 votes were cast illegally during the last election, or who declares via Twitter, without a scintilla of evidence, that Barack Obama ordered the tapping of his phones, or who says that . . . well, again, you get the point. Such ravings, I submit—ravings which are part of a consistent, disturbingly persistent pattern—are simply too outrageous, too fantasmagoric, to be asserted by someone who knows them to be false. And since the person uttering these and so many other patently ridiculous ravings is the sitting President of the United States, the implication of his actually believing them to be true is nothing short of chilling. Our president, I fear, is delusional. In the run-up to the election, his supporters cheered their man for his unfiltered rhetoric—for his blunt language and his plain talk—no matter how nutty the thought. I fear that what we’re seeing, with each passing day, is that it wasn’t just the thoughts that were nutty.